This Marriage Cross Pendant in Sterling Silver is a celebration not only of the love that Christ demonstrated on the cross, but also of the love between a husband and wife. 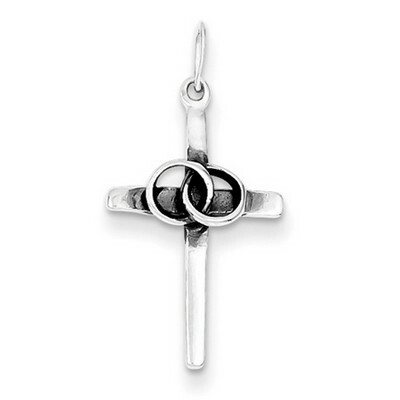 A simply crafted silver cross with smooth beams is the foundation for this piece, providing an instantly recognized symbol of faith; resting on top of this cross is a pair of interlocking wedding bands, an emblem of the bond that holds a marriage together when that marriage is rooted in mutual faith. Crafted from the highest quality of sterling silver used in jewelry, .925 sterling silver, this cross has a cool look that's always in good taste and a polished finish that adds to its timeless grace. This pendant provides a clear and stylish reminder that Christ's ultimate sacrifice on the cross provides an example for us, demonstrating the selfless love that husbands and wives are to have for each other. Cross measures 20mm (13/16") x 12mm (1/2") not including bail. We guarantee our Marriage Cross Pendant in Sterling Silver to be high quality, authentic jewelry, as described above.